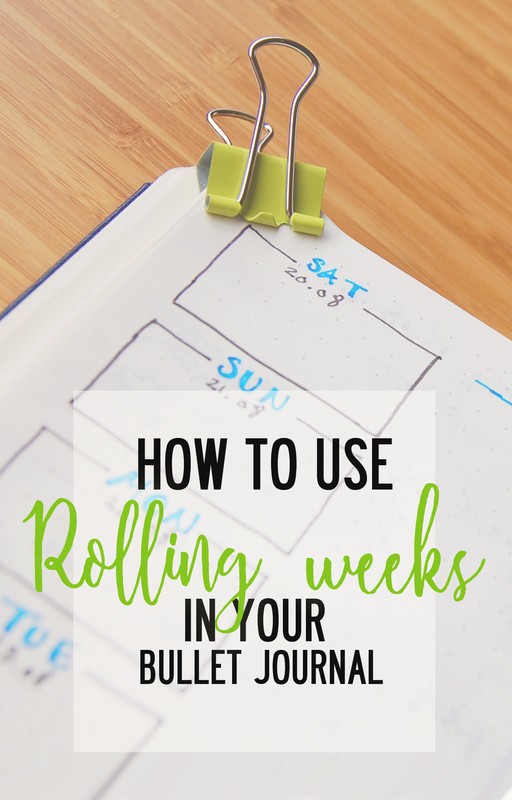 The past few weeks I’ve tried something new in my Bullet Journal: Rolling Weeks. Read on to find out how it went! Back in July, Jess at PrettyPrints&Paper posted a Bullet Journal Dictionary with a lot of useful information, and some ways of customizing your Bullet Journal that I had never heard of! It’s an inspiring post that gave me a lot of new ideas. In general, both with the Bullet Journal and in life, I tend to find something that works for me and to stick with it. I’m a creature of habit and I do like it that way. The trick is just to make sure you actually have the right habits and ways of doing things. So I am trying to challenge myself to try out new things with my Bullet Journal, I want to explore the fantastic possibilities out there! The first thing I decided to try was rolling weeks. So what are Rolling Weeks exactly? Rolling weeks is way to plan your near future. 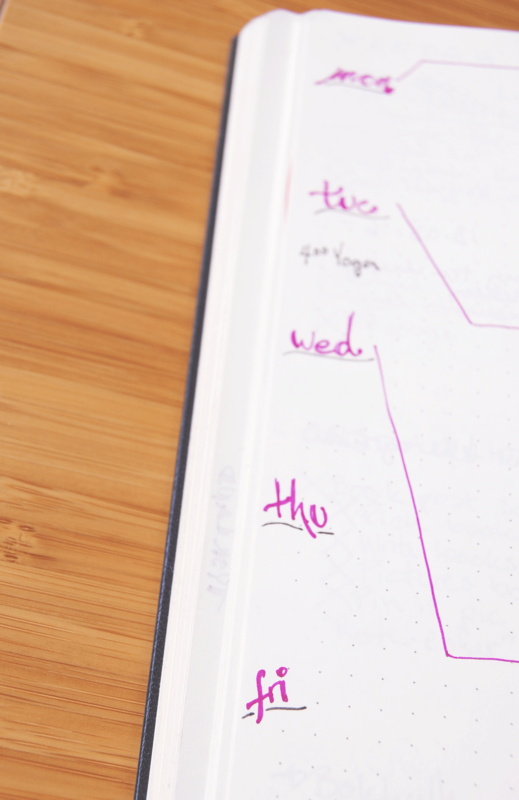 Because of how the BuJo system rests on the rapid daily logs, it can be challenging to find a way to track the future. There is the monthly log and future log of course, but those does work better for more overall-long term plans. What’s coming up tomorrow, in two days or one week however? That’s more difficult to have an overview of without flipping a lot of pages. With rolling weeks you get the best of both worlds: the fluidity of the daily logs, and the overview of the weekly logs. With rolling weeks you keep your dailies, but add some space for the next seven days, to put in appointments, events or important tasks. When you start a new spread of daily logs, write in the next 7 days somewhere. I choose to write them along the side of my spread, but you can also write them along the top or bottom of your page. Then you simply do your daily logs as normal until you reach the end of the spread. When you start a new spread you write in the next seven days again starting from your first day on the new spread. So if you ended the last spread on a Friday, you start the next page on a Saturday with the rolling weeks doing the same. Your future planning is taken care of by the rolling weeks because they are always a step ahead of your Daily Logs. This is the one I like the best; clear boxes and a structured feel to the whole spread. I tried this for two spreads with only a color change. I like the style of it a lot. All in all I like the rolling weeks, and I’m really happy I tried them out. However there was a few things I missed: I usually have weekly spreads with a weekly habit tracker. I didn’t really find a way to include them in this system. I had them at the bottom of the last page in the spread most of the time. But it did get frustrating when I used more than two pages on a week and had to turn the page back to check my habits. Final grade: The rolling weeks are a great way to track the near future and I like it as an idea. Personally however I don’t think I will keep it going. The plan is to work on my weekly spread instead and see if I can incorporate some future planning into that. How about you, have you tried the rolling weeks? What did you think? Or will you try it now? Parece interessante. Eu costumo fazer na lateral uma lista to do do mês, com ou sem data, mas gostei da ideia de fazer caixas na lateral com os dias certinhos. I’ve used the BuJo system for about 2 1/2 years now. I started with original system, but I never really wrote down much each day and I really needed to be able to plan way in advance. I switched to using Molskines weekly spread while keeping the original monthly spread. I used to use the small Moleskine cahiers and I never had enough room to plan anything and I only had enough pages for about 3 months at a time. As for the weekly layout, I had this same problem too. So eventually I moved to a composition graphing book to give me more room to have a weekly layout (if you like things neat but don’t want to use a ruler for everything? Graphing books are great!). I really liked how Molskine’s weekly planners did it, where the week was a two page spread: one page for the days of the week and the opposite page was blank. My only modification to the spread was that Saturday and Sunday were on the same line instead of having a dedicated line for each day (I don’t really have my weekends planned out so it doesn’t really matter for me). With that I had plenty of room to put any daily tasks/events/appointments in the days I have marked off and I had a whole page to fill with running tasks for the week, notes, trackers, and pretty much anything else I needed for that week. I hardly ever completely fill up my pages each week. The last BuJo book I used as an 18 month planner/calendar. This year, I only have one year’s worth of monthly/weekly spreads and left the rest of the notebook for strictly notes/collections. I folded down and taped the last four pages into two really sturdy folders cos I found that I never had a place to put loose papers. Hope this helps someone else out. It sure helped me and I don’t think I’ll go back to another planner again. Thank you for the tips Gillian! It’s so amazing that we all can do some many different things with the same system 🙂 I’ve actually started to do one page for all the days and one for tasks and notes, and it’s really nice 🙂 Thank you for your comment! I am fairly new to bullet journaling (6 days in now!) but I loved reading your article for future tips and tricks. I have a weekly spread across two pages with a box for “next week” somewhere across the layout. However, I also put a monthly layout at the beginning of the month, so I can write any notes mportant things on the specified dates there and will only have to flip back a few pages, if that. You could clip weekly pages together so the monthly payment I g is always on the next side of one you’re currently using… if this is making sense. 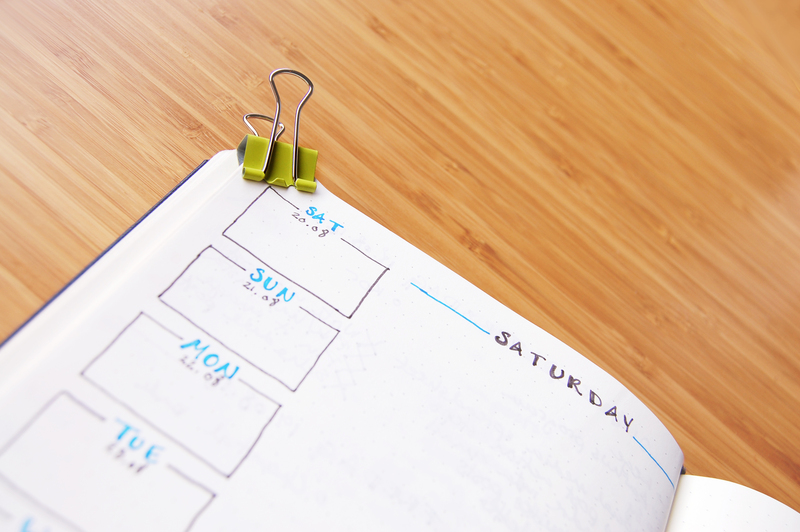 This has probably already been recommended – but what if you used the “Dutch door” method to incorporate the rolling week and the habit tracker?? I’ve been attempting to use the Dutch door as a way to stay focused on what needs to be done NOW and over the week, and not on what didn’t get done yesterday or last week. So far none have. Eek beautiful enough to share, but the concept I thought may be the middle ground you are looking for in your spread!! Happy planning! I’m just so scared of cutting into my BuJo! 😛 But maybe that’s something I should try to get over. I couldn’t read your blog, and I really wanted to, because of the share bar on the left-hand side of the page. I was trying to read it on my PC, not a tablet or a phone. Posting this comment will be difficult, too, as the submission fields which I assume are name/email, etc., are blocked out by the bar as well. Yes share bar makes this hard to read. Limits you to the inch or two above and below share bar. Oh I’m definitely going to do this, this really really helps! I do a variation on the traditional Dutch door where instead of cutting and removing the top strips, I leave them on there and use them for trackers and things. I am most definitely going to put a rolling week in there next week!! Thank you for this concept!